I almost didn't use the mirror card - it's so pretty, but so darn difficult to photograph! But you need a little sparkle and shine for a Christmas card, right? I used two circle nestabilities and a Papertrey bow die along with an Old Island Stamp Company sentiment. I used hot pink rather than red for the bow, just for fun! This sketch is a wonderful layout and can be used in so many ways - if only there were more time! Smashing Card! Is the mirror cardstock local or from the internet. You've used other colors of it to great effect too, but I've only seen it in gold at stores where I've shopped. I love your style and always know it won't ever be something I've ever seen before. Thanks for inspiration EVERY day. Cool card! I love the hot pink with the green, and the placement of the image off the edge. The shiny paper ROCKS!!! LOVE this Ardyth! So glad you played in this week's CAS(E) this Sketch! 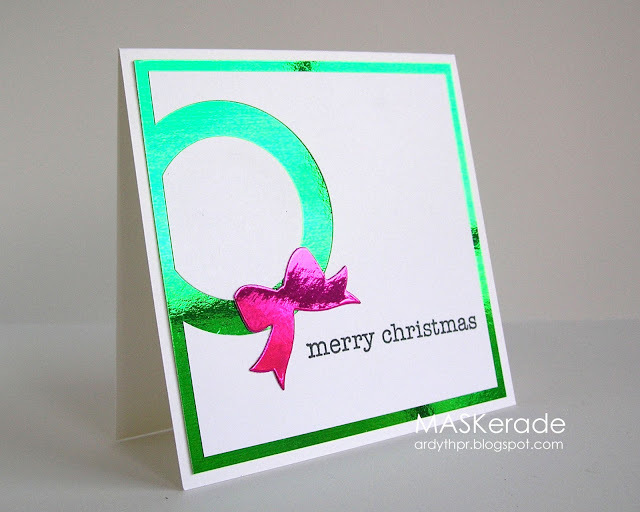 LOVE the cardstock and how the image is the negative of the wreath. Really neat design! So happy to have you at CAS(E) this Sketch! Wow, I love. This. Stunning really! Ardyth I LOVE the shinny paper! Great job on this challenge. So deceptively simple! You never cease to amaze me Ardyth. Love the mirror cardstock! What a fab card. Great idea with the pink bow! Love the negative image. Spectacular! Wow! So simple yet such amazing impact! So glad to see you at CAS(E) this Sketch! Thanks for dropping by my blog ... it's so great to get your feedback. Love this card ... the mirror finish really adds to the christmassy feel! Glamourous and shiny! Wow! I love it, Ardyth! Thanks so much for playing along with us @ CAS(E) this Sketch!